Former Maryland quarterback Danny O'Brien has contacted Penn State and is interested in transferring to the school. PSU coach Bill O'Brien said so Wednesday afternoon outside Holuba Hall, where Penn State's Pro Day was taking place. The coach said he was not aware of any scheduled spring visit. "Danny does have an interest," Bill O'Brien said. "I'd say we're one of many schools that he's looking at. "If I can do anything to improve the football team within the rules, whether that's a recruiting idea or a scheme or transfer, then I'm definitely gonna look into it." Danny O’Brien’s high school coach, Todd Willert, said Tuesday afternoon by phone his former player will start visiting schools during spring practice and make a final decision by mid-April. Wisconsin, Penn State or Vanderbilt seems to be the most likely landing spot, though Willert would not confirm any scheduled visits. Willert said O’Brien wants a pro-style offense and a coaching staff that makes him feel comfortable. When pressed about visiting Penn State, Willert said, “I’m not 100 percent sure on that right now. I really don’t know. All three schools run a pro-style offense. Wisconsin used N.C. State transfer quarterback Russell Wilson in 2011 and won the Big Ten but has a new offensive coordinator in Matt Canada after Paul Chryst was hired as head coach at Pitt. Vanderbilt coach James Franklin served as Maryland’s offensive coordinator from 2008-10 and took some former Maryland assistants with him to Nashville, so there's certainly a comfort level there. Penn State, however, has Bill O’Brien, the former offensive coordinator for the New England Patriots who has worked with Tom Brady. It also has a muddy quarterback situation in fifth-year senior Matt McGloin and junior Rob Bolden, who split snaps throughout 2011. Those two, as well as redshirt sophomore Paul Jones and incoming freshman Steven Bench, must grasp a new offense and impress a brand new offensive coaching staff. Truly, the job is up for grabs. O’Brien has not specifically addressed Danny O’Brien but did say he’d be open to a transfer if he added value to the roster. Danny O’Brien will complete his undergraduate degree in business this spring, allowing him to transfer to a Football Bowl Subdivision school and immediately play — as long as he enrolls in a graduate program not offered at Maryland. Danny O’Brien, a 6-foot-3, 215-pound quarterback who threw for 1,648 yards, seven touchdowns and 10 interceptions last year would have two years of eligibility remaining. 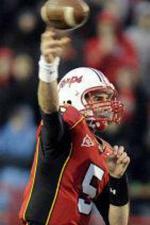 As a redshirt freshman, he threw for 2,438 yards, 22 touchdowns and eight interceptions. Willert said O’Brien likely will enroll in some type of business program to earn his Masters Degree. The question, of course, is where. “He’s gonna wanna look for a pro-style offense,” Willert said. “I don’t think he’ll visit any school that is not a pro-style offense. He’s not a zone read guy. “He’s a very intelligent kid — just a great kid, student of the game, all the stuff you kind of hear. You hear a lot of stuff in the media . . . it’s a lot more in-depth to what happened at Maryland. He’s not like he’s trying to shop himself around. He needs to find a better situation for him.